1. Be written in clear and unambiguous language. 2. Fully set forth all material terms, including the terms of broker compensation. 3. Have a definite duration or expiration date, showing dates of inception and expiration. 4. Be signed by all parties to the agreement. B. An employing broker shall not assign a real estate employment agreement to another broker without the express written consent of all parties to the agreement at the time of the assignment. C. A licensee shall not procure, or attempt to procure, a real estate employment agreement from a party who is already subject to an existing exclusive real estate employment agreement unless the licensee has received written acknowledgment from the party that the execution of additional real estate employment agreements could expose the party to liability for substantial additional commissions. Nothing in this subsection shall be construed to abrogate any civil liability of a licensee arising out of this conduct. D. A real estate employment agreement is not required for a licensee to represent a party in a transaction. However, a real estate employment agreement is the “required means” by which a real estate broker is entitled to compensation for its services. A real estate agreement is not required for a licensee to represent a party in a .
E. For the purposes of this section, “real estate employment agreement” means a written agreement by which a real estate broker is entitled to compensation for services rendered pursuant to section 44-101, paragraph 7. Advertising and marketing by the broker and by salespersons, brokers, and others in the broker’s employ. A designated broker shall establish a system for monitoring compliance with statutes, rules, and the employing broker’s policies, procedures, and systems. A designated broker shall supervise associate brokers, salespersons, and employees of the employing broker and shall exercise reasonable supervision and control over activities by the employing broker for which a license is required. An employing broker is responsible for the acts of all associate brokers, salespersons, and other employees acting within the scope of their employment. A designated broker may use the services of employees to assist in administering the provisions of this Section but shall not relinquish overall responsibility for supervision and control of the acts of the employing broker’s employees. A designated broker who, upon learning of a violation of real estate statutes or rules by a salesperson or associate broker under the broker’s supervision, immediately reports the violation to the Department is not subject to disciplinary action by the Department for failure to supervise the salesperson or broker. If an employing broker maintains one office and employs a designated broker, no more than one other licensed person, and no more than one unlicensed person, the employing broker and designated broker are not required to develop and maintain written policies, procedures. An employing broker is for the acts of all associate brokers, salespersons, and other employees acting within the scope of their . Transactions requiring a salesperson’s or broker’s license. Use of disclosure forms, contracts, and employment agreements and documents affecting the rights or obligations of parties. Filing, Storage and maintaining documentation. Use of unlicensed assistants by a salesperson or broker. The delegation of authority to others to act in the Broker’s behalf. How the Broker familiarizes the agents with the requirements of the state, federal and local laws relating to the practice of real estate. Advertising and marketing of the brokerage and its agents and others. 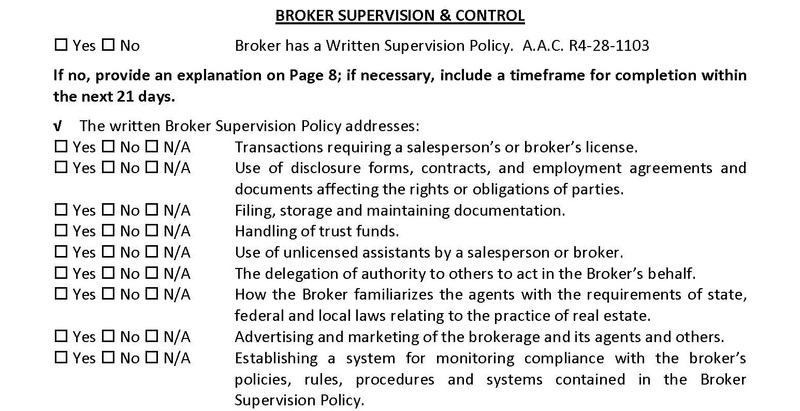 Establishing a system for monitoring compliance with the broker’s policies, rules, procedures and systems contained in the Broker Supervision Policy.